This week Solar Flare dedicates a flaming solo set to friends made and fun experienced at Burning Man this year. 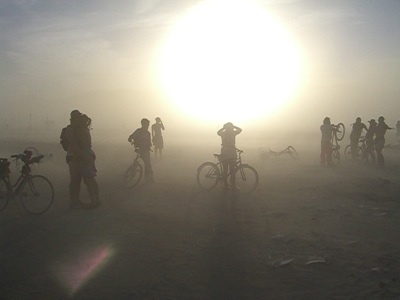 I was long overdue for a trip to Black Rock City and I only realized it once I reached the playa. For one magic week I was immersed in a place I had only glimpsed in dreams and visions years ago. There was stunning art all over, friendly people playing and connecting on deep levels, and amazing sounds. Being a creature of music I will let my selections tell the story of my first Burn. The synchronicities, bike rides, alien landing and all-night raving you’ll have to ask me about next year, if you’ll join me there. (I don’t want to miss this neon-lit planetary/cosmic event ever again!) For now, pull on your goggles and dust mask-here comes a whiteout. This entry was written by kenny , posted on Friday October 02 2009 at 07:10 pm , filed under radio shows . Bookmark the permalink . Post a comment below or leave a trackback: Trackback URL. Just wanted to leave word that I really enjoyed this episode. Great diversity of music. Only downside was the inclusion of the overplayed tarantula but I got over it quickly. Lookin forward to making it out on a Friday very soon! Kenny, this is a masterpiece! I’m obsessed with this episode. Thank you for sharing your first Burn experience through music. what a great playlist ! i really enjoyed th show. thx. This is what I have been waiting for. Do you have a CD or something I can download? Just magic. Thank you so much.